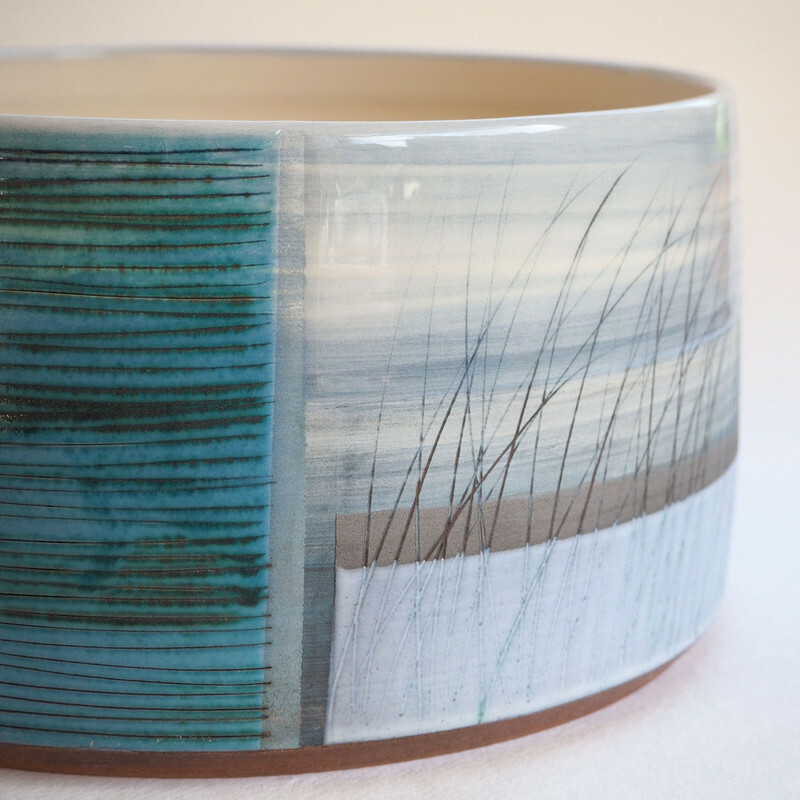 I make handmade ceramic work which explores an ongoing interest in mark making and texture. Inspiration is drawn mostly from the natural landscape and photography provides the means of bringing the ideas back into the studio. Sketchbook work enables me to plan but the creative work happens as I start work on the clay itself. Clay slabs are rolled to the desired thickness before I begin work. The clay doesn't simply act as a canvas, it becomes part of the picture as I paint, print, impress and score onto and into the surface. The layers of colour are interspersed with marks and texture and despite having an initial plan I often work intuitively; changing and adapting the surface of the clay as I progress with the piece. When this stage is complete the work is allowed to dry out in a slow, controlled manner to prevent warpage. Far from being finished the work has yet to go through two firings which will dramatically alter the nature of the clay. After the initial firing the pieces have more layers applied in the form of metal oxides and glaze. All of these processes combine to create a unique richness and depth to the surface of each piece of work. Wall pieces and tiles have been the vehicle for my exploration of colour and texture for some time now. Recent additions to this come in the shape of wheel thrown bowls and vessel forms. I learnt to throw on the potters wheel many years ago during my A level Art classes. It is a process which requires a balance of give and take, an understanding of the properties which can move a form from perfect to disastrous in one tiny movement. For many years I have worked with colour and texture on flat clay, unable to see how my love of mark making could marry with the thrown form. The answer came in simplifying the thrown form to create a surface, a canvas on which to build up the richness I had achieved on my wall pieces. Using similar techniques I now make jewellery which compliments and broadens the range of work I have to offer.